New ADA rules may only protect dogs and miniature horses as service animals due to progressively more people buying bogus Internet-based National Service Animal Registry credentials to declare their pets as service animals. It is becoming increasingly common for people with disabilities to own service animals such as seeing eye dogs, as helpers to cope with seizures, monitor meds, and for minimizing behavior problems for children with autism. Yet there are creatures of all types working as service animals such as Capuchin monkey helpers, and even more unusual service animals like ferrets, parrots, pot-bellied pigs, and snakes. If these peculiar animals have service-animal credentials, businesses could face $55,000 civil penalties for asking about disability or denying access and thereby violating a person’s civil rights. However, starting on March 15th, only service dogs and trained miniature horses will be protected under the Americans with Disabilities Act, reports The Wall Street Journal. Why this drastic change? Because some people believe there are too many bogus service animals – people who are taking advantage of the system in order to keep their beloved pets handy at all times. WSJ mentioned two service iguanas which freak some people out. Cosmie Silfa has a large iguana service animal called Skippy. When Silfa takes his iguana on the bus and for walks in the park, he totes around a letter from his psychiatrist stating that Skippy “helps him to maintain a stable mood” which helps his depression and helps to keep him clean and sober. People such as she, pretending to have a disability and passing off bogus pets as service animals, are the ones who may ruin therapy and service animals for everyone. In Rhonda’s case, it’s a dog which will for sure still be an ADA safely declared service animal in which businesses still will take great risks to asks about disability or reason for the service animal. 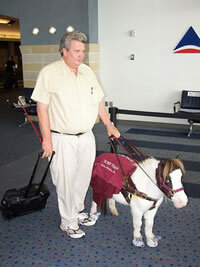 Although I’ve yet to see a miniature seeing-eye horse inside the grocery story working as a service animal, they – like dogs – will be ADA approved in businesses where food is served or sold for human consumption. Other species of trained service animals are expected to be permitted in some other public places. If peculiar animals are truly certified as service animals but the ADA bans them, then aren’t we moving backwards in people with disabilities rights and in their abilities to live a “mainstream” life? It is quite peculiar the way the system works. Even though Skippy & I saved each other’s life, I never take advantage. I don’t take him everywhere, or very crowded places, or food establishments any more, since he’s so attention grabbing now. We just want to continue to enjoy our lives, with each other’s company, since we understand one another so well. Dear Rhonda: Shame on you. There should be a $50k penalty for people like you who take advantage. You don’t “hate to take advantage” — if you did, you would respect the people who truly need service dogs and not bring your PET with you everywhere. You are a liar and a fraud. And by the way, “therapy dogs” are not service animals, and do not have public access rights. Any business would be well within their right to ask you to remove your dog from their place of business. Tessa: I hope you will forward this comment on to Rhonda. Rhonda you should know better than that, because of what you are doing is making it hard for people with actual disabilities like myself. See unlike you with no “fake” disability, I actually have 2, PTSD and damaged shins, which actually makes it difficult to walk but unlike you due to my injuries, I have to wear cam-walkers to walk correctly. And Im military on top of that. But unlike your Maxx , my Max was given to me as a trained Service dog, and is trained to help me. I didnt pay a bogus fee, to make him one. But i will say this I take him where I go when Im not with friends to help me. When i have help he stays home to play with the other dogs, but still i didnt pay a bogus fee to have him. Its individuals like you who, ruin the reason we have our dogs to help us. Ohmygosh, you all disability folks need to relax. So what is Rhonda harming, again? Nothing. America is anti-Darwinism , so you will be just fine. with the plentitude of disability acts/laws whatever. . Maybe the laws against animals in public should relax as well. Everyone has a handicap. Integrity doesn’t handicap civilization with it’s own handicap… You can’t make it upstairs in your wheelchair to a restaurant…. Just make the restaurant pay for the 1% who can’t. -Stupid! YOU “can’t” make it so YOU make it happen. So annoying/accommodating. Adapt!